Company Kids catalog features the cool kids clothing styles that all of the cool kids want to wear. Find everything from cool clothes for girls, boys and babies to footwear, bedding, kids room decor, accessories and personalized items for your cool Company Kid. Enter the Promo Code - T9FREE - on Company Kids checkout cart. Valid in the continental US. 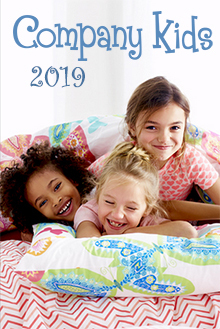 Company Kids catalog - The Company Kids catalog is jam-packed full of cool kids clothing for girls and boys as well as fashionable kids shoes, cool kids bedding and stylish decor that will transform any room into a kid-friendly space that your sons and daughters will love hanging out in! Plus, check out the Company Kids personalization corner where you can personalize your kids clothes, bedding, towels, backpacks and hooded towels just for them! Cool kids clothing - Company Kids dresses up your kids in style as well as your kids rooms with hip and cool kids clothing ensembles for trendy boys, girls and babies. You'll find all of your basic kids tops, tees, pants, dresses and footwear for your little cuties, plus onesies, playsets, outerwear and more comfy clothes for your tiny baby bundles of joy. Kids rooms decor & furniture - You've stocked up on plenty of cool kids clothing and bedding, why not treat them to a brand new bed? Shop for modern kids furniture including beds, headboards, desks, chairs, dressers, bookcases, storage and more kids room essentials for boys and girls. You'll also find fun kids room decor featuring lighting, wall art, shelves, hanging hooks, rugs, bath decor and more. Cool clothes for girls and boys - Featuring cool kids clothing brands like Moby Goby, the Company Kids catalog makes sure that your entire family is covered with adorable fashions combined with affordable prices! You'll find a wide fitting range from infant and toddler sizes to cool clothes for boys and girls in sizes 18/20. Don't forget to take a peek at their selection of cool kids shoes that will complete their new ensembles perfectly! Cool kids bedding - Some kids dig dinosaurs while other kids prefer flowery patterns and all things tie-dyed. No matter what your kid loves, Company Kids will help them sleep on it with basic bedding and blankets, slumber bags and comforters for kids. From wild safaris to buried treasures, ladybugs to butterflies, they'll have amazing adventures on cozy sheets and cool kids bedding sets that they'll love dreaming and dozing on, night after night. The Company Kids collection has been supplying Moms with fashionably cool kids clothing for boys, girls and infants as well as a fabulous collection of kids footwear, bedding and room decor items that are all kid-tested and Mom approved.